When the Globe troupe plays Santa Monica, it'll be slightly different from its London production. For one thing, it's indoors. And there aren't any pillars onstage. Or groundlings. For many people who go to see productions of William Shakespeare's plays at Shakespeare's Globe Theatre in London, the play on view is often of less consequence than the experience of being at the venue itself. The structure was conceived as a replica of the Globe Theatre on London's South Bank where the Bard's own troupe of players performed in the early 1600s. Located only a few hundred feet from the site of the original Globe, the nest-like circular auditorium with its thatched roof open to the sky, pillar-supported musicians' gallery and standing area for groundlings surrounded by enclosed seating balconies for the more deep-pocketed patrons provides a unique way of experiencing the works of Shakespeare. "The Globe creates a sense of event that you don't get anywhere else," said theater director Christopher Luscombe, who has helmed two Shakespeare productions in the building. "The Globe is the true star of the show." 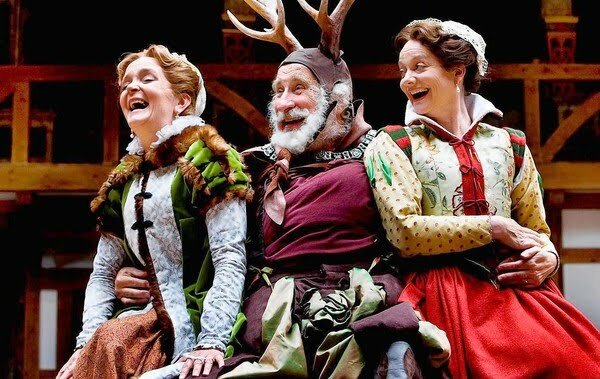 When Luscombe and an ensemble of actors from the Globe come to the Eli and Edythe Broad Stage in Santa Monica this week with a revival of their 2008 production of "The Merry Wives of Windsor," the "Wooden O" will remain in London. Remounting productions conceived for the Globe on other stages — especially the outsize auditoriums that it has often played in the United States — presents significant challenges for both artists and presenters. When the Globe toured five U.S. cities last year with "Love's Labour's Lost," directed by Globe artistic director Dominic Dromgoole, auditorium size was a major issue. "Some of the theaters were so enormous that it was difficult for the actors to form easy and relaxed interactions with audiences," said Dromgoole. "At the Globe, the line of communication is open. But if you're in a big, 1,800-seat theater which stretches to eternity, you have to stand at the front of the stage and shout your head off." Amplifying the actors' voices isn't always an effective solution, because it affects the quality of the sound, often making Shakespeare's poetry come across as hollow and tinny. "It takes a skilled sound designer to get the use of microphones right and avoid the blasting American musical style," said Ron Severdia, founder of the PlayShakespeare.com Web portal. In addition, the particularities of the Globe's stage design don't easily translate to other venues. Luscombe's production of "The Merry Wives of Windsor" makes special use of the physical assets at its home base. Several scenes take place along walkways built across the groundlings pit, and the actors frequently hide behind onstage pillars and chase each other around the Musicians Gallery. And like all the Globe's productions, it uses only natural light. As a result, Luscombe and his team are significantly reconfiguring the production for the Broad Stage as well as the Michael Schimmel Center for the Arts in New York, where "The Merry Wives of Windsor" will go after its run in California on this short, two-city U.S. tour. Compensating for the loss of the walkways through the groundlings section, which spawned much of the production's sense of fun and intimacy at the Globe, won't be easy. "We can't have walkways at the Broad Stage," Luscombe said. "So we're working with a double revolving stage composed of two concentric circles. The outer circle is a revolving walkway that circumvents the playing area." Local audiences may well respond as warmly to the company's take on Shakespeare's 1602 comedy as they did to the Globe's last visit to the Broad Stage with its sold-out run of "Love's Labour's Lost." "We can't re-create the atmosphere of the Globe completely, but we can get close to capturing its energy," said Dale Franzen, artistic director of the Broad Stage. For his part, Luscombe is positive about reworking his production to suit the Santa Monica venue. For one thing, he's glad to excise the Globe's intrusive, onstage pillars. "It's wonderful to be free of them, because they create huge sightline problems. You have to keep the actors moving around to make everyone happy," the director said. For another, Luscombe won't miss the constant distractions that come with experiencing a play at the Globe, such as planes flying overhead and sudden downpours of rain. "Comedy relies on focus, and in the controlled indoor environment of the Broad auditorium, with its stage lighting, it will be a lot easier to hold people's attention."